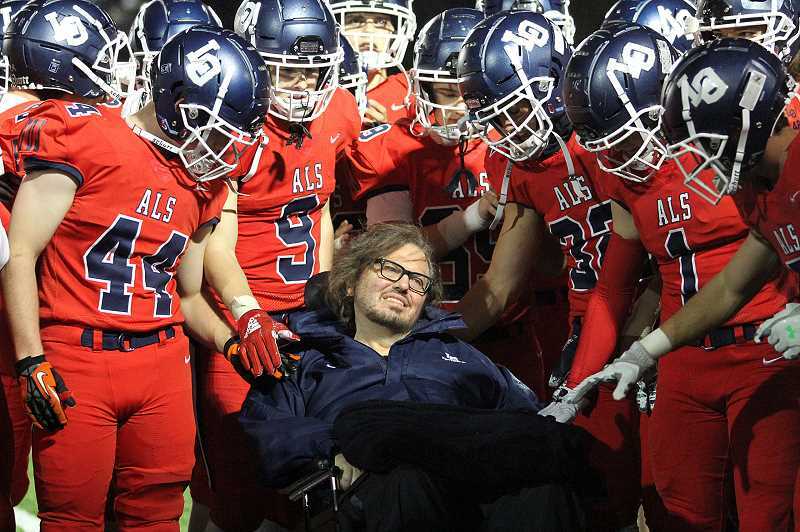 Lake Oswego traditionally wears its navy blue jerseys at home, but the Lakers' stadium was a sea of red Friday night — an emotional finale to a week spent raising awareness about Amyotrophic Lateral Sclerosis (ALS) and money to fight the terrible disease. At the heart of the effort: Laker assistant football coach Jeff Young, who has battled ALS for more than three decades. Amyotrophic lateral sclerosis (ALS) is also known as Lou Gehrig's Disease, named for the great New York Yankees first baseman who died from ALS in 1941. No cure for ALS has been discovered despite years of research, and when a person is diagnosed with ALS, they're only given three to five years to live. But 35 years after his diagnosis, Young still lives in Lake Oswego and is still involved with the football program at LOHS, where he used to play. Every week, he writes inspirational messages for the team, and he's typically on the sidelines or watching from the mezzanine at every game. Last week, LOHS students showed Young what all of that means to them. Among other things, Laker football players accompanied Young as a team in the annual ALS Walk in Portland, where they proudly called themselves Jeff's Warriors. And an Ice Bucket Challenge at halftime of Friday's game got school administrators involved in the effort, too. 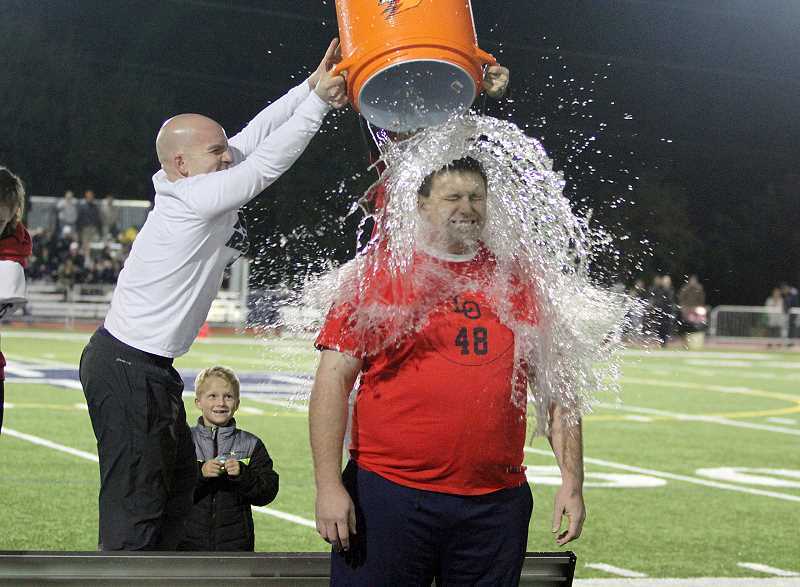 "I love that our students do so much for our broader community, and this Ice Bucket Challenge was part of their fundraising and awareness-raising efforts for the ALS Foundation and Friends of Jeff," says LOHS Principal Rollin Dickinson, who got drenched Friday night. "We enjoy being playful and supporting our students in their efforts to support others, though we often stay a bit more dry." Activities director Chris Hill, who teaches marketing and digital media at LOHS, said the school had two goals for the week. "One was to raise awareness, and the second was to raise money," Hill says. "During the week, we had many videos, images and other random activities promoting and informing about ALS Week. We also sold T-shirts and wristbands and took donations as well." Those shirts and wristbands turned the Lakers' stadium into a sea of red Friday night. Final numbers aren't in yet, but Hill says all of the proceeds will be split 50-50 between the ALS Association and the Friends of Jeff Foundation.